“This is a very rare and early version of the ARP 2500 Modular Synthesizer. 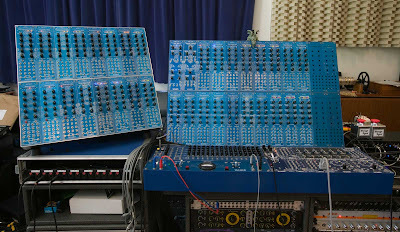 It has a larger cabinet with 3 x 5 Modules (instead of 2 x 6 Modules on standard ARP 2500s) and the switch matrix in the top section has 10 positions (instead of the 20 positions on later ARP 2500s). 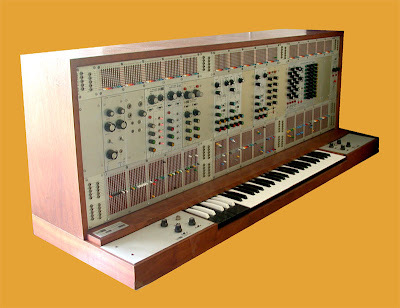 The ARP 2500 for sale here has the serial number 014 (model 2003, serial 70 – 014). I have been told that these very early 2500s were hand-built by the ARP/Tonus crew to the most exacting standards, they are probably better than later models (which of course are excellent as well). It has 4 oscillators (2 of them with invertible waveforms), 3 excellent 24dB Filters with resonance and built-in mixers for up to 4 audio and 2 CV signals (5 CV inputs per Filter total), 3 VCAs with built-in mixer for 2 CV signals (plus another 3 fixed voltage CV inputs), 6 Envelope Generators (4 of them with Gate Delays and normal & inverted outputs. All 6 Envelope Generators have a switch for single or multiple triggering), a fixed voltage source (i.e. to shift all Oscillators at once) and a pink/white noise source with built-in filters. You can find more details including the full module list and shots at the auction while it is up, followed by this post on Matrixsynth. What you are looking at is a Wiard 300 Series modular system owned by gary. Click here to see the image in all of it’s glory. Wiard produced the 300 series several years ago only to put them on hiatus, while Grant Richter of Wiard moved the line exclusively to the 1200 series. Grant has just recently re-introduced production of the 300 series. Update: I just got the list of modules in this shot. Rather than throw the formatting of this post off, you can check out the list here. 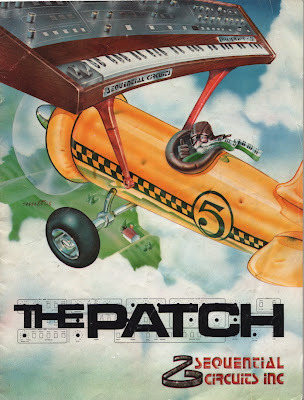 Stephen Jones of synthwood, sevcom and of course the Prophet 5 forum recently discovered an issue of Sequential Circuits “The Patch.” He scanned the full issue and posted it here. Definitely check it out for a bit of synth history, including the “Digital Interface for the Pro-One” article, a must have for any Pro-One DIYers. BTW, if you know of where to find any other issues, please post a comment. Stephen is looking for them, and I can make sure it gets to him. What you are looking at is the prototype of what would eventually become the classic EMS VC3S Putney, followed by the EMS Synthi used by such classic acts as Brian Eno and of course Pink Floyd for the bass sequence of Dark Side of The Moon. Click here for a full sized shot. The image comes from this excellent historical article on the VCS1 and VCS3 on Switched on. And I’ll leave you with a little Roxy Music with Brian Eno on the VCS3. As always, for more daily synth-related content check out Matrixsynth.